The old thinking about the brain was that neurons were given at birth, and then progressively died. A researcher named Altman found otherwise in 1962: he showed that adult human brains created new neurons. Few believed him, even fewer found that interesting. However, by 1995, incontrovertible evidence of new neurons was found in at least two regions of the brain. And if one blocked neurogenesis, one blocked learning. The first memory organ of taxicab drivers learning a lot of streets, the hippocampus, got visibly enlarged. A rat hippocampus creates at least 10,000 new neurons a day. Yes, a vulgar rat. Yet, the mind is not just about adding neurons. For those keen to remember their past, fresh neurons are the worst things. Newly formed neurons in the hippocampus — an area of the brain involved in switching from short term memory to the longer sort — dislodge previously learned data, a May 2014 Science article shows. That’s counter-intuitive at first. Naively, one would expect new neurons to mean a better brain, thus better memory. On second examination, though, if neurons are the brains, new neurons mean new brain, not the old brain, with its old memories. Many studies have shown that boosting neural proliferation before learning enhances memory in mice. More neurons increase the capacity to learn new memories. However, memory is based on circuits, synapses, and maybe pre-existing “grandmother neurons” (whatever that exactly means: it could be a tight group of cells). If one adds new elements, it makes sense that they have nothing to do with pre-existing neuronal geometries. 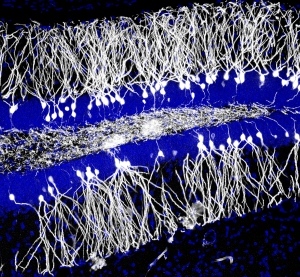 Quite the opposite: creating new neurons could clear old memories… Therapeutically. In the 2014, Science study, newborn and adult mice were trained to fear an environment that brought electric shocks. The mice learned the task quickly. Infant mice remembered the horror for only one day, adult mice retained the fear for weeks. This difference correlates with neurogenesis. Memory persistence in newborn mice was enhanced genetically and by chemically suppressing neurogenesis after learning. In adult mice, four to six weeks of regular exercise — an activity known to promote neurogenesis — reduced the previous fear. 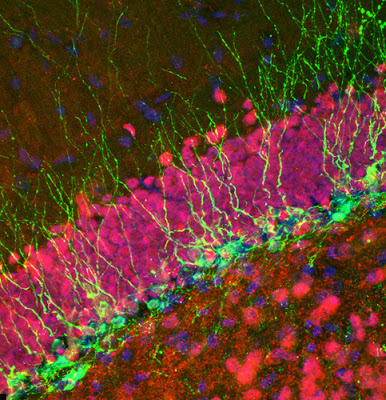 Massive neurogenesis in young animals explains why youngsters do not remember their early life. And, as luck has it, an animal model exists. Guinea pigs and Chilean rodents called Degus have longer gestation periods than mice, and thus reduced brain growth after birth. Baby Degus and guinea pigs do not have infantile amnesia. Yet, heavy exercise and drugs promoting neurogenesis brings it on. Just as neurogenesis tends to deny the past, it denies visiting again the feelings one had then. That’s resentment. French for feeling again: re-sentiment (with a second “s” added to make a snake sound). Nietzsche used the word “ressentiment”, because German has not word for “resentment”. That semantic gap is, per se, reason enough to suspect that Germans walloped in it: if one avoids a notion like the plague, it is an indication that one indulges in it. Luther is full of resentment against the Jews, and Hitler against the French, and then, the Jews. For the philosopher Kierkegaard, ressentiment occurs in a “reflective, passionless age“, stifling creativity and passion in passionate individuals. Individuals who do not conform to the masses are made into scapegoats and objects of spite by the masses, to maintain the status quo ante and to imbue the masses with their sense of superiority. According to Nietzsche, the more a person is strong-willed, and dynamic, the less place and time they have for contemplating what’s done to them. The reaction of a strong-willed person (a “wild beast“), when it happens, is short: it is not a prolonged filling, and take-over of their entire intellect by an obsession. It’s impressive to realize how the most recent neurological findings (above) relate to those philosophers’ insights. The super intelligent person is always in full neurogenesis, in her haste to model the world with more faithfulness. That makes her unable to hold a grudge: she has better thing to think about. This opens a new way out of the eternal wheel of conflict, and various vicious circles: react as wild beast to attack, but then smother what led to it under the new mindset of neurogenesis. Instead of rejecting the world as painful, and hoping for a better one as Christians, Muslims and Buddhists do, think the world again, and the old problematic will fade away. The same may apply to entire societies, nations, or religions, or civilization. If any of these favor ressentiment, it will have to spurn neurogenesis, or its societal equivalent. Just as individuals will. Hence a vicious circle: the more resentment, the less imagination, and intelligence, and thus the more madness in crowds as in individuals. Let’s notice, moreover, that denial and bad faith (a la Sartre, De Beauvoir) are very close to resentment. So what would the moral conclusion of the preceding be? Generating new ideas, just as generating new neurons, is how to break out from the past’s vicious circles. Higher intelligence is also a better morality. Abstract: Wisdom requires turmoil. Too much calm brings neuronal, intellectual, and even moral disaster. A case in point is the devil-may-care attitude of the USA in the 1930s, lauded by those who celebrate calm and peace, yet condemned by common decency. Wisdom is about embracing turmoil, and then, dominating it. It requires heavy construction inside the brain, and the greater the new wisdom, the greater the new effort. Prometheus did not just discover fire, but a multiverse of expanding possibilities. This is why the biologically given philosophy of Homo crushes that of theocrats and other superstitious, ravenous plutocrats. Men are all about overcoming themselves. At least those men who think hard enough so as not to finish as the main course. Careful meditation is often helpful to establish new wisdom. Yet, turmoil is always necessary, to foster higher wisdom, in individuals as in societies. It’s important to know this, because promoting too much calm comes at the expense of wisdom. Let me explain. Whenever we try to define a mental state, nowadays, we have to remember that there is more than 100 neurohormones known. Some are correlated to rage, others to anxiety, fear, love (oxytocin). Neurohormones define chemical states, somewhere in the brain. Maybe in just one place, maybe in many places. Those correlate with emotions, often through the activity of sub-units in the brain (say the amygdala for fear). Which neurohormones are tightly connected to which emotions, and how, is yet to be ascertained in nearly all cases. We just know that, to define which emotion a brain, or part thereof, is undergoing, it will be necessary to determine neurohormones, their presence, secretion, or suppression. People love to project “calm”. When “calm” is faked, is it real? “Calm” is not far from stealth. Any predator, be it the average cat, or the ancient Chinese strategist Sun Tzu, knows that stealth is of tremendous advantage for a successful aggression (Sun Tzu’s book, various treatises on war, and a casual look at history show that surprise is half the victory). Is there a neurohormone of “calm”? That’s unlikely: the lion stealthily, crawling on his belly in the grass toward the prey projects “calm”, but for the occasional twitch. Yet its neurohormonal war systems are primed up for maximum violence. At the time of the attack, they will be unleashed with great fury, demonstrating that feline clam is just a tactic. A sleep hormone does exist: that’s Melatonin. Conclusion? “Calm” is rather deceit, or computation, or then relaxation and laziness (something brains need, just as they need sleep… probably because they need to establish a hierarchy-network of knowledge). Alex Jones wrote a second post on “Wisdom comes out of calm”. He explains that calm is how to deal with dogs. Meanwhile he explicitly said in a preceding reply to me, that the Americans were wise to calmly wait for Hitler’s attack (see below). Equating lack of calm with being “drunk” is alien to me. I drink water, I find that smart. A mind that is not calm, does not have to be angry: there are other moods. When the anger neurohormones are on, the mind is certainly not calm, but that does not mean that, when the mind is not calm, the mind is angry. It could, simply, be an attentive, or hard thinking mind. Defining “calm” neurologically has not been done. Yet. The only calming hormones I know of, serotonin and melatonin, rather induce sleep. “Calm provides the opportunity for wisdom to emerge, metaphorically like soil waiting for the seed. The mind that is angry, in emotional turmoil, acts like the drunk, and they will never make wise choices or actions. Here Alex is alluding to my position that American calm while Hitler raged, killed and attacked, was monstrous. Hitler had given explicit instructions not to make Americans angry. Hitler considered white, racist America to be half Nazi already, and thought of the USA as a natural ally. Hitler’s plan went awry, in great part because enough Americans had the great courage to get angry, in spite of their compatriots’ selfish calm tolerance of infamy. The Americans refused to support France and Britain, and the Commonwealth, in 1939-1940. Calmly supported by hordes of American plutocrats and their corporations, the Nazis came very close to annihilating France and Britain in 1940. Consequence? More than 70 million people died, including six million Jews assassinated calmly. I understand that this vicious American policy calmly established the empire of the USA, and its famed “American Century”. And that calm propaganda has made most people believe that the intervention of the USA was purely to rescue democracy, instead of the much greater plot that it truly was. In 1945, and thereafter, the USA supported massively at some point, Stalin, Mao, Ho Chi Minh, Nasser, the FNL, Saddam, even bin Laden, or the Taliban. Those details have to be forgotten: the Devil dwells therein. I refuse to call that “right”. I call it wrong. I even call it an infamy, or a whole succession of infamies. Something the USA ought to be eternally ashamed of was the support American political and business leaders gave to the Nazis. Consider this telling detail: the USA, as a state, had to wait for Hitler to declare war to them to find something wrong with him. It was more than despicable, and unwise. It was outright criminal. That, of course, is my calm opinion, forged by decades of calm, careful considerations. And the real truth is even worse: German generals asked for American and British help to get rid of Hitler. Would the democrats please make clear that they would join France in a war against Hitler? Calmly, British and American authorities denounced the generals… to Hitler. So calm is definitively not wisdom, but something that can masquerade as wisdom. In truth, no new wisdom can be reached without turmoil. Most great creators lived in turmoil. And that’s no accident. There is an obvious neurological reason for it. Emotions build reasons (neurohormones guide the construction of new neuro-geometry, by growing axons, dendrites and synapses just so). To have new, better ideas, one needs to wipe out the wrong brain geometry, thus new neurohormones, that is new emotions, have to invade, submerge, and grow new geometry. Thus fresh passions and actions bring new and better reasons. To model the world better, we have to engage the world, further. Experiments do this. Indeed exercise itself, let alone challenges, bring higher mental performance. And it’s not just performance, that they bring, but also even neurological existence. Rats with a non-stimulating environment see their neurology shrink. Neurology was evolved for turmoil. Without it, the very reason for its existence disappear. And so it goes for entire civilizations: the more turmoil, the more wisdom. The Greeks, a notoriously bickering lot, as Nietzsche pointed out, were not just about Apollo (calm, beauty, poise, balance), but also about Dionysus (agitation, turmoil, passion, mess, craziness). This is the main idea of Nietzsche’s “Birth of Tragedy”, an analysis of the genesis of Greek greatness. Civilizations which are too calm produce nothing, not even their own survival. This may be the problem of Europe now. Pathological calm was certainly the problem of the civilizations that Genghis Khan and his generals overran. The Mongols said so explicitly. The fierce horsemen accused those they invaded to be sleepy plutocracies mistreating their own people. Notice that Greek civilization, although it was conquered, greatly survived, so strong were its animals spirits. There is nothing calm about the main Greek notions. Nor is there anything calm about science. Physics has energy at its core. In physics, calm does not exist. Truth comes out of trial, error, and the passion to engage in them, which rampant imagination. Really new ideas disturb all brains, that’s why they are new. I have had many of my comments censored, all over the Internet, because they contained what was perceived as new, thus inconvenient, ideas, or facts. Latest example? Scientific American publishes carefully controlled articles on the climate. I dared to mention that there was coral in the Mediterranean. The six words comment was censored. (An email informed me of this.) I guess that, as long as I stay calm, I will keep on paying for “Scientific American” (which is neither scientific, nor American). But is that the wisest course? Would not anger be a better adviser? However, an achievement of modern science, was to disprove these philosophies of Amor Fati (Love of Fate). Starting with the discovery, and subsequent disappearance, of Sun spots in the Seventeenth Century, and then the discovery of biological, and geological evolution by Jean-Baptiste Lamarck and his somber company, turmoil was found to reign all over. The universe, biology, man himself, let alone technology and civilization, are never, ever standing still, nor repeating themselves. Everything is a force that goes. New wisdom is necessary for survival. It’s not a matter of choice, and esthetics. Those who will still stand in the future, individuals or civilizations, will have thought anew, and their brains will have mutated, from their own volition, or dismal condition. Others will have turned into the main course, literally, and figuratively. 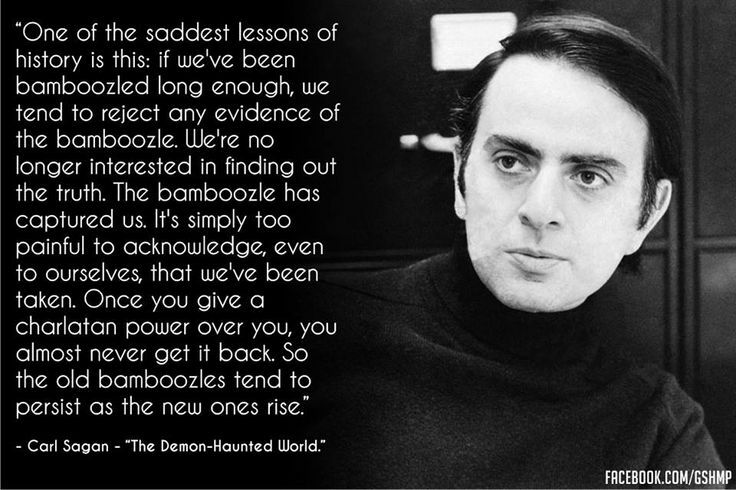 Carl Sagan viewed the Confidence Trick, or Bamboozling, as an important concept. It is. And not just because it explains why people goose step behind dictators, superstition and other insane ideas. The basic mechanisms behind bamboozling also explain not just the problem of Free Will, but how the mind itself arises. One of the most alarming meta-lessons of history is this: If we’ve been bamboozled long enough, or spectacularly enough, we tend to reject any evidence of the bamboozle. We’re no longer interested in finding out the truth, we can’t even find the truth. The bamboozle has captured us. It’s simply too painful to acknowledge, even to ourselves, that we’ve been taken. It’s best to ignore it, to reduce our pain. So we ignore it. Once you give in to a charlatan, or to madness, it’s very hard to get common sense back. In practice, it’s even worse. Charlatans reign through institutions. If the institutions have been themselves bamboozled, the effect is much amplified. This is what happens in places such as North Korea. Hitler is a famous case. Again and again, in history, obvious charlatans bamboozled their subjects into extinction. Other cases are closer at hand: the much celebrated North American educational system is still trusted. Yet, it is the Trojan Horse of plutocracy unleashed. Higher education is so expensive that only a small percentage of the population can afford it for their children, without crushing debt (tuition in the top universities is above pre-tax median family income: $54,000 at Harvard). It’s bamboozling on an Academic scale. Recently the Wall Street Journal revealed that, after spending more than six figures paying for an education, learning to fly, “airline pilots face a new danger: minimum wage”. Great bamboozling at work here. Don’t worry: the owners of the airlines are making a fortune, and a galaxy of profiteers make good money from the so called private universities, be it by just exploiting their sport franchises. Why do we react to bamboozling with denial? It’s in the nature of neurology. It’s a case of colossal mental inertia, intrinsic to the nature of minds. Neurology, whatever its details, is something built from the outside. The environment determines its nature. However, once a neurology is built, it’s built. The environment, in the past (that’s where the connection with Free Will is) has built it. In the past. A neurology is not build like a software program. An incarnated neurology is built like a dam: once it’s built, it’s built. If rain does not fall anymore, and the lake dries up, the dam is still there. Neurology is not just very hard to change. It is made for this environment that built it. If the environment changes, the changed environment cannot rebuilt it from scratch, for the simple reason that it already exists. A mind is as a sand castle. Once it has been built, and the builder, the environment, changes, or moves away, it stays behind, and decays. It’s the simplest observation, it has momentous consequences. I have been bamboozled personally more than once, big time, typically by large, honorable scale institutions, and the small critters that serve them inside, like bacteria in termites’ guts. Once we have been taken by some confidence trick, can we rebuild our minds enough to reject it? True, one has demonstrated in experiments on mice, that neurogenesis is necessary for learning, and happens at all ages. So neurogenesis, the fabrication of neurons is always active. Maybe we could use that to rebuild our minds? No. Most of the brain has been established long ago, during youth. One may be able to change the details, it’s much harder to rebuild a functioning machine, than to make it from scratch. Is there a way to mitigate the ease with which one can get bamboozled? Yes. To learn to take one’s knowledge and certainty, with a grain of salt. To practice the “WHAT IFS”, systematically. To teach the mind the yoga of doubt. Any sure thing that can be bent, should be bent, with “What Ifs”. The yoga of doubt can even be extended to the realms of emotions. Emotional geometrodynamics is actually one of the interests of sports. Many sports involve states when one is at war. Even somebody who dives in apnea has to fight. Against her, or his self, when they desperately want to breathe. Going to war in normal society is not just abnormal, but discouraged. In sports, it’s encouraged. However, some of the most pervasive Confidence Tricks are not just made possible by denial, as Carl Sagan says. Denial is what they sell. Take Christianity (or Islam). What the Christian institutions sell is an unbelievable story, yet, if one believes in it, it’s most comfortable. All we have to do is be good, and believe (that the Confidence Men and their sacred texts tell the truth). Then we will be rewarded. There is no more struggle: submission is the key to heaven, and if we die, alleluia! Thus life can be experienced as a happy dream, or torpor (as Marx noticed). However the Con Men (= Confidence Men”), in particular the Plutocrats, can rarely find a balance of exploitation. So at some point, the dream turns into a nightmare. The dam breaks, the sand castle is wiped out by a tsunami, and the great passion of revolution sweeps the land. We can’t just cultivate our garden (whatever Voltaire said). When the wave comes, all gardens get washed away; we have to run. Given enough time, the wave always comes, and washes civilization away. Right now it’s just washing the biosphere. Although the destiny of humanity is not clear. However, passion, in practice, is all the destiny we need. Yet not all passions are good. Passion for violence has to be diverted (hence the obsession with watching team sports, war by proxies). But passion for truth ought to be indulged in ever more. Be it just to save the biosphere.